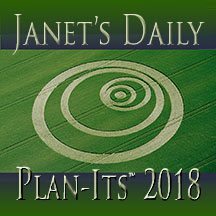 This version of Janet's Daily Plan-its 2018 is formatted for use like any PDF. You can print any of the pages that you'd like to. It contains links to internet resources. Seize the RIGHT day! 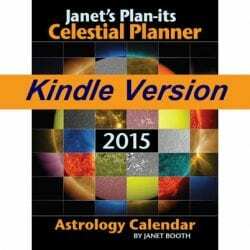 Find favorable times for your important plans in this unique forecast calendar by astrologer Janet Booth. Drawing on her 37+ years of experience, this is her 18th Janet’s Plan-its (5th year for ebooks). Like a cosmic weather report covering influences affecting everyone regardless of one’s zodiac sign, Janet’s Plan-its appeals to novices, students and professionals. Readers use it to the depth of their astrological knowledge. Day ratings and messages are geared for North American time zones only. Customers of prior Janet’s Plan-its – Note: this calendar does not include weekly highlights nor extensive write-ups of New and Full Moons. Hopefully, for that type of coverage, you’ll get on the free eNewsletter list (contact Janet to request this), enjoy Janet’s blogs or watch her LOOKING UP show, now on YouTube. The December 2017 show, 2018: Time to Get Serious, gives an overview of the year. This is the PDF version that works the same way as any PDF. You can read it onscreen or print out any pages you’d like. It’s paginated for margins of 1″ top, right and left, and 75″ at the bottom so there’s room for the footer with the page numbers in a bigger bold font. All digital versions of the calendar cost $8.99 (US). After downloading, visit a while at AstrologyBooth.com to read, study, shop or sign up to follow Janet’s blogs. Enter your email in the footer of any page to receive a free email every morning with the day’s rating and message from Janet’s Plan-its. Thanks to Steve Alexander for permission to use his photograph of a crop circle in Hampshire, England. See his fantastic work at temporarytemples.co.uk.